I was recently contacted by the baking recipe website Baking Mad to see if I wanted to submit an Easter recipe for a competition they’ll be running on their site. My initial reaction was to worry about the diet but after some thought I decided to go for it because a) I have a boyfriend who is more than happy to consume any naughty foods that need eating and b) everyone is allowed a treat once in a while! And, well, I think the word treat was designed with this recipe in mind. 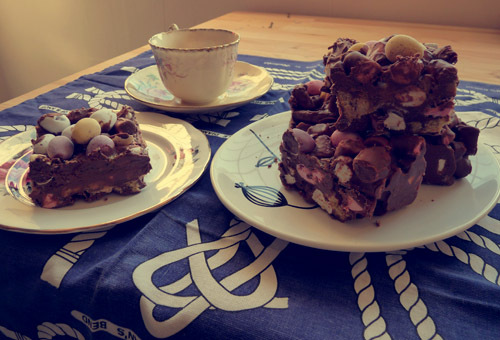 With mini creme eggs, mini eggs, marshmallows, fudge and digestive biscuits, this Rocky Road recipe is utterly sinful and also completely moreish. A dangerous combination! In terms of skill, this recipe requires none (it doesn’t even require any baking!) so it’s ideal for whipping up a quick batch as a treat for friends, or for making if you have little people in the kitchen! You can swap any of the ingredients as you wish – why not try it wish cherries or dessicated coconut, or swap the digestives for your favourite biscuit? 1. Line a square tin with greaseproof paper. I used a standard brownie tin. 2. Break the milk chocolate into chunks and place them in a bowl above a saucepan of boiling water. Gently melt, stirring occasionally to ensure all the chunks are melted. 3. 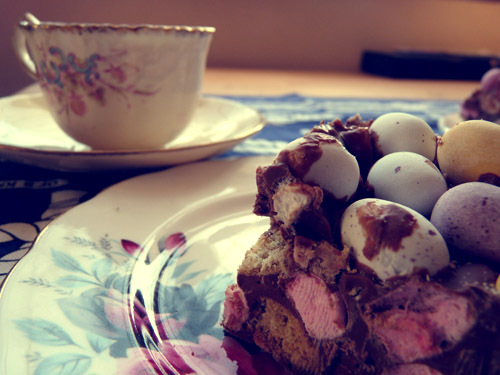 Whilst the chocolate is melting, put the marshmallows, broken up digestive biscuits, fudge chunks and Cadbury’s creme eggs into a bowl and give it a mix so they’re evenly distributed. 4. Once all the chocolate has melted, pour in the bowl of ingredients and give it a good mix – but be quick as it sets very quickly! Pour the mix into the tin. 5. Now, push mini eggs into the mixture so they’re still visible from the top. 6. Place the tin in the fridge – they will be ready to eat within 2-3 hours. 7. Cut into bitesize pieces and enjoy! 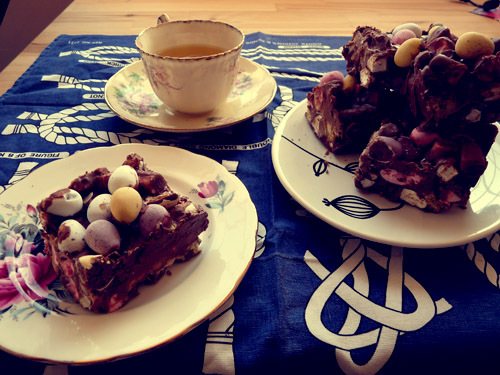 Don’t forget to check out all the other yummy Easter recipes on Baking Mad; I’m definitely going to try my hand at making some of their hot cross buns – I don’t like sultanas so their cranberry and chocolate hot cross buns are right up my street!